Carmine Lake and B.J. 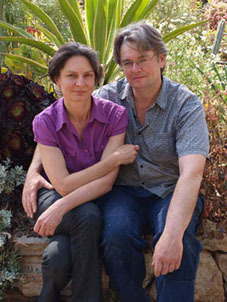 Moore met while living in Byron Bay in the 1990s, with Carmine originally from Geelong and B.J. from Adelaide. After collaborating with other artists in a number of studio and community art ventures in the Northern Rivers Region of NSW, B. J. and Carmine set off to find the ideal studio. ...Our search eventually brought us to the old copper-mining town of Kapunda in South Australia, an hour north of Adelaide and ten minutes from the renowned Barossa Valley. When we first saw The former Evangelical Lutheran Church of St Pauls, we knew the search for home and studio was over. The 1864 building -- originally a Primitive Methodist church -- is known locally as ‘Little Glory’, a name we have retained and used for our studio, framing business and nursery.